Whether you’re the superstar talent, the sound man, or a runner, we know that food on set at a TV or film shoot can make or break your day. So when we got the call to say a couple of “Nasty Women” needed some tasty location catering it was impossible to say no. Rebel Wilson and Anne Hathaway were in London shooting their latest film in autumn 2017, Nasty Women – a remake of Dirty Rotten Scoundrels. Our experienced chefs served up some traditional British fare including battered cod and chips, alongside flavours from France, Morocco and Japan, amongst others. Not to mention brilliant breakfasts, including our famous tasty porridges, and the awesome afternoon tea served either from unit base or on set. 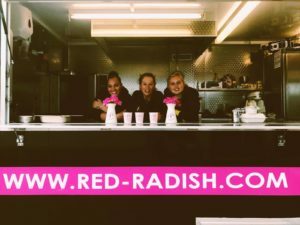 The riders for the talent were also delivered in typical Radish style, with beautiful presentation and a friendly smile, no request or requirement too big or too small. 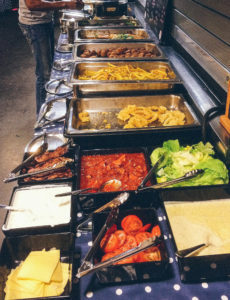 Our eco-friendly lunch boxes allowed the film crew the flexibility to grab food on the go, and wherever unit base went our reliable team of chefs and wait staff was right behind with one of our catering trailers. We also regularly took lunch in hot boxes to location to offer the crew another level of convenience.